TranscriptionWing aims to improve interaction and support to its customers as well as reach out to new clientele through its fanpage on Facebook and Twitter. Inquiries and suggestions posted via the fanpages may now be addressed by the team easily and quickly. Inquiries and suggestions posted via the fan pages may now be addressed by the team easily and quickly. 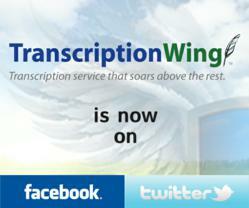 TranscriptionWing™ is a New York-based company that provides fast, accurate, and cheap audio transcription services. TranscriptionWing™ specializes in general transcription services with fast turnaround times at very low transcription rates. It is under Civicom Inc., a reliable global leader in serving the marketing research community with advanced virtual communications solutions for the world's top organizations, with a strong industry presence in facilitating virtual IDIs and focus groups, online multimedia boards, and mobile research. Civicom is powered by a combination of proprietary audio conferencing technology, online meeting software, web technology tools, superior recording capabilities, and a proprietary transcription system. For more information, visit http://www.transcriptionwing.com.